litigation costs and funding mechanisms. PART I The AHRC Project on Private Enforcement and Collective Redress in the EU. Chapter 1 Private Enforcement Context and Project Background Barry Rodger. 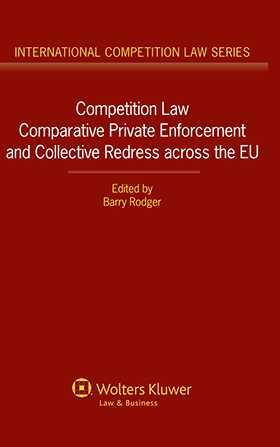 Chapter 2 Institutions and Mechanisms to Facilitate Private Enforcement Barry Rodger. Chapter 3 The Empirical Data Part 1: Methodology, Case-Law, Courts and Processes Barry Rodger. Chapter 4 The Empirical Data Part 2: Provisions Relied Upon, Remedies and Success Barry Rodger. Chapter 5 Collective Redress Mechanisms and Consumer Case-Law Barry Rodger. PART II Private Enforcement, Economic Incentives and Alternative Collective Redress Mechanisms. Chapter 6 Comparing Economic Incentives across EU Member States Morten Hviid & John Peysner. Chapter 7 A View from across the Atlantic: Recent Developments in the Case-Law of the US Federal Courts on Class Certification in Antitrust Cases Arianna Andreangeli. Chapter 8 Fast, Effective and Low Cost Redress: How Do Public and Private Enforcement and ADR Compare? Christopher Hodges. Chapter 9 Concluding Remarks Barry Rodger.